Confronted with declining public budgets for education on the one hand, and the need for more resources on the other, many developing countries such as India, have been examining alternative methods of financing higher education. One such mechanism is student loans. A student loan programme is not a new phenomenon in India. The National Loans Scholarship Scheme has been in operation since 1963. This chapter critically reviews the experience of implementation of the National Loan Scholarship scheme. It examines strengths and weaknesses and problems specific to this programme in India, with a view to identifying measures for improvement in the scheme. Published in Higher Education 23 (4) (June 1992): 389–404. © Springer Nature. 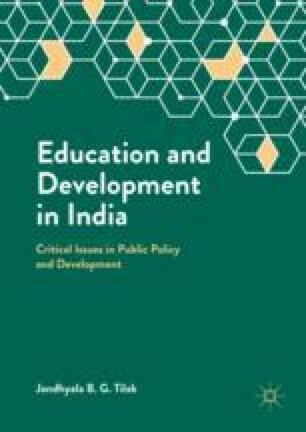 The author is grateful to the officials of the Department of Education, Ministry of Human Resource Development, Government of India, particularly Mr. Karamchand and his colleagues for the discussions and the material provided that were highly useful in the preparation of this article. N.V. Varghese read earlier drafts and offered helpful comments. Thanks are also due to the participants of the IIEP Educational Forum on Student Loans in Asia (held in Genting Highlands, Malaysia, November 1990), Maureen Woodhall and others for their comments. The views expressed here are the sole responsibility of the author. The statistics presented in the paper are drawn from annual publications, viz., Annual Report(s) and Education in India, both published by the Department (or Ministry) of Education, Government of India, New Delhi, unless otherwise stated.